Meeting of the MEP Interest Group on Brain, Mind and Pain and the Interest Group on Mental Health, Well-being and Brain Disorders – in partnership with the European Brain Council. 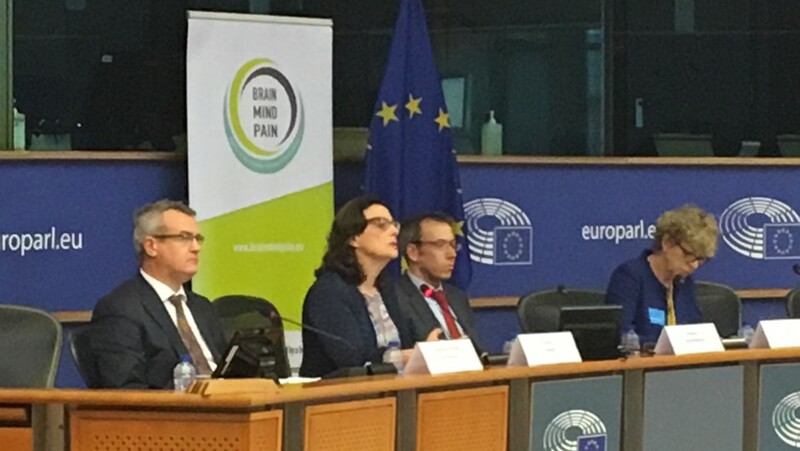 Jana Zitnanska MEP welcomed participants on behalf of the MEP Interest Group on Brain, Mind and Pain, the Interest Group on Mental health, Well-being and Brain Disorders and the European Brain Council. She underlined the fact that brain, mental health and chronic pain disorders are common, disabling and costly; over one in three European citizens are affected during their lifetime – currently over a 165 million people in Europe. Brain disorders often have no cure and drastically reduce quality of life and ability to participate in society, at school and at work. Up to eight out of ten people living with a brain or mental health disorder remain untreated or inadequately treated although effective treatments exist; brain and mental health disorders are still surrounded by stigma. This is a challenge for society as a whole; the 2010 European Brain Council study provided a solid estimation of the economic costs of brain disorders in Europe, i.e. close to € 800 billion. This meeting would address a follow-up study by the European Brain Council, i.e. the Value of Treatment research project and White Paper. This explores the value of early intervention. This session intended to address the conclusions and recommendations from the European Brain Council’s Value of Treatment research project and White Paper. It explored the value of early intervention, using case-studies in four disorders – presented from various stakeholder perspectives. Jana Zitnanska then handed the floor to Paul Arteel (GAMIAN-Europe) to chair the first session. In his introduction, he stated that his organisation welcomed its involvement in the VoT project as many GAMIAN-Europe members find that treatment is either unavailable or inadequate. Research has shown that this ‘treatment gap’ applies to some 50% of those experiencing mental health problems – so obviously, closing this gap is a priority for patients. It should be borne in mind that treatment of mental health issues is relatively recent compared to treatment of physical health issues – for instance, the first medication (for schizophrenia) was only developed some 60 years ago. Paul Arteel underlined that a holistic approach is required when defining ‘good treatment’ – medication is just one aspect. The first speaker, Patrice Boyer (EBC) provided a brief overview of the background and key messages of the VoT project. Brain disorders comprise mental as well as neurological disorders; these disorders are highly prevalent as well as very costly as demonstrated by the 2010 EBC study. In most of these cases the cost of the disorder is linked to the cost of ‘non-treatment’ (i.e. absence of treatment, inadequate treatment or delays in the onset of treatment). Ironically, a range of complementary interventions does exist – however these are not always available. To ensure the continuity of care from the very beginning, early identification and intervention for people at risk or patients with a brain disorder is key for optimal disease management and effectuating better clinical outcomes. A large body of research links early intervention to measurable health gains (e.g. improved survival rates, reduced complications and disability, better quality of life and lower treatment costs); this finding is further demonstrated through the VoT case studies which focused on 9 different areas, i.e. schizophrenia, Alzheimer’s disease, epilepsy, Parkinson’s disease, Multiple Sclerosis, Stroke, Restless Legs Syndrome, headache and Normal Pressure Hydrocephalus. The objective was to identify treatment gaps and causing factors along the pathway, propose solutions to address these and to evaluate the socio-economic impact of these solutions. Patrice Boyer briefly focused on schizophrenia; this is one of the most severe and disabling mental illnesses. The treatment success rate can be high if early identification of patients at risk, early detection of psychotic symptoms, and early intervention at the prodromal phase are enabled. The types of intervention can vary depending on the stage of the disorder but they have always to be integrated and coordinated. Mr Boyer also referred to the work on headaches as these affect half the European population, particularly tension-type headache, migraine, and medication-overuse headache. While headaches are treatable they are still significantly under-diagnosed and in many cases patients receive inadequate medications. Education of primary care practitioners and pharmacists can play a key role in increasing diagnosis, proper treatment and appropriate referral to the tertiary level of care, if needed. The main conclusions of the VoT project relate to the need to focus on risk reduction, education (disseminated in collaboration with associations of patients and families) and the need to rethink and restructure health services. There is a need for a healthcare system transformation: seamless, coordinated, and ‘patient-centred’ systems at national, regional and local level are required. Whenever possible, integration of care in the community is a great asset. 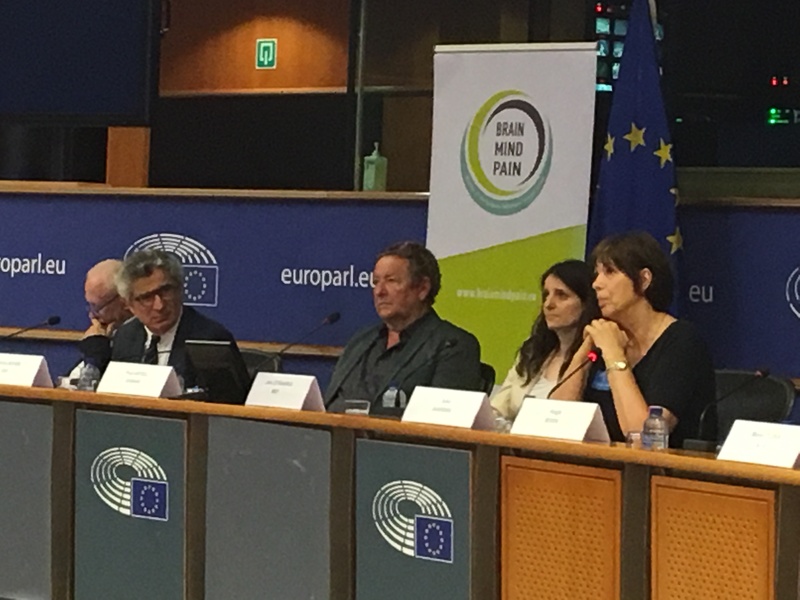 The next speaker, Michal Boni MEP, underlined the importance of today’s discussion in order to promote better knowledge and understanding of brain disorders. He welcomed the VoT project and White Paper and its focus on prevention and early intervention in order to bridge the main diagnosis and treatment gap and underlined the need for MEPs to be part of this multi stakeholder initiative. The VoT project and White Paper help to progress the understanding of the key issues and questions related to integrated care, implementation of what exists and what is required and address the current fragmentation of healthcare provision. There is a clear need to involve patients and their social environment, from a human as well as a medical perspective. Individuals should be much better informed about brain disorders so that they can recognise symptoms, and thus contribute to early intervention. Risk groups should be identified as the burden of brain disorders needs to be reduced. In this respect more use could be made of new technologies to support prevention and early intervention. These new technologies have huge potential, also in terms of data generation and analysis, thus supporting better risk assessment. This can also help create services that are personalised and more adapted to individual needs, which is particularly important when it comes to mental health disorders. From the work of the VoT project it has become clear that health care systems need to be restructured. National brain plans could help in this respect, addressing brain health in a holistic and integrated manner. Best practice exchange is another helpful mechanism and this can be facilitated by the EU level. Many MEPs are supportive of these ideas. The next four speakers each addressed one of the specific areas addressed by the VoT project. Dr Alastair Webb (University of Oxford) emphasised that there are 1.3 million new strokes per year, a third of which occurring in persons younger than 65 years of age. Approximately one third of those affected ultimately die as a result; and stroke is the leading cause of acquired disability and a leading cause of dementia. The direct costs of stroke are estimated to be €30 billion with indirect costs likely exceeding € 50 billion. Research has forecast a 34% increase in the total incidence of stroke by 2035, with an increasing incidence in young people (under 55). There are significant gaps in providing known effective treatments for stroke, including primary prevention of atrial fibrillation and hypertension, a lack of Acute Stroke Units and limited rehabilitation. Early, comprehensive stroke unit based care is critical for effective acute treatment, secondary prevention and early rehabilitation of stroke patients through providing cutting edge acute treatments (clot-blusters and mechanical clot retrieval), optimal investigation, multidisciplinary expertise, early rehabilitation and effective transition to the next stage – and are cost-effective as well. Although changes to services need to funded and driven at the national level, the EU is vital to develop Europe-wide guidelines and accreditation, increase training in cutting edge techniques and facilitate the exchange of expertise and knowledge between centres, whilst continuing to support stroke research from basic science through to implementing preventative strategies (hypertension, AF detection), optimal acute stroke pathways and rehabilitation. Vinciane Quoidbach (EBC) informed the audience that in Europe, some 700.000 people live with MS and that the condition is the leading cause of non-traumatic disability worldwide. It is a lifelong burden. The direct (medical and non-medical) and indirect costs amount to over €15 billion per year. All types of costs increase significantly with increasing levels of disability: from €23,000/case/year for mild MS to €77.000case/year for severe MS. Indirect costs increase as well (productivity losses for sick leave, incapacity to work and early retirement); informal care costs largely falling outside of the health and social care systems also need to be taken into account. There are delays in detection, diagnosis and (early) treatment (due to lack of access to neurologist, limited access to specific (unaffordable) medicines and restrictive reimbursement policies). Early diagnosis and treatment is key as the inflammation is most severe in the first years of the disease; early treatment can reduce the conversion of CIS to CDMS (Clinically Definite MS) and is less costly. In MS, the key paradigm is equal access, early diagnosis and early use of disease-modifying treatments (DMTs) through a personalised medical approach and optimised target treatment. Disease-modifying treatments (DMTs) at the early stage of relapsing-remitting multiple sclerosis (RRMS), including clinically isolated syndrome (CIS), are available to slow down the progression rate and disability accumulation. In other words, early intervention can reduce the societal burden of MS. The search for the cause(s) of RLS and for new treatment strategies has to be intensified in order to reduce the burden on patients and the high cost to society. Aagje Ieven (EUFAMI) provided the families’ perspectives on early intervention in schizophrenia. While family members are slowly getting more involved in treatment and recovery planning by service providers, their involvement is still insufficient – and this leads to loss in quality of service as well as quality of life; in general, services do not cover the needs of family members. For almost all family members the first contact with health services starts with a crisis – this is a clear sign that prevention, screening and early intervention are not working. Aagje Ieven underlined the needs and issues of families, i.e. Community based services for older people with severe mental ill health need to be created. Awareness raising to combat stigma. Closing the session, Marek Plura MEP emphasised the importance of early intervention and diagnose and appropriate, personalised treatment, which will greatly benefit patients. Early intervention can improve the quality of life of patients (and their families); it will give patients a chance to fulfil their potential and lead more active and complete lives (i.e. the personal and social dimension) as well as have a positive effect on the cost of treatment (the economic dimension). The European Parliament cannot address all these issues nor solve all the problems; however, MEPs do have the opportunity to speak with their national counterparts and with other policy makers in their countries and are able to help raise awareness of these important topics. The VoT project is hugely supportive as it has provided (and will provide) evidence-based arguments for further (joint) actions. Aim: This presentation and panel discussion intended to explore possible next steps in the VoT project – exploring the application of the developed methodology to other disease areas. Session chair Ann Little (President, EFNA) highlighted the objective of the session and gave the floor to Frédéric Destrébecq (EBC), who informed the audience of the next steps of the VoT project (VoT2). A first draft of a multi-annual plan was submitted to the EBC General Assembly in June, with the aim to present a consolidated proposal at an EBC Strategic Workshop in September and endorsement by the EBC Board in the same month. All case studies of the VoT focused on early intervention as a key area of the care pathway (addressing research as well as organizational needs for brain disorders) as well as a pre-condition for optimal disease management and achieving better clinical outcomes. Fragmentation of health care services and lack of coordination between health and social services. This means that more basic, translational and clinical research is needed both to understand the causes and progression of brain disorders as well as develop new treatments. The public health perspective should be included in every way. VoT2 will address and integrate the unmet needs in new disease areas and the following have already been proposed: depression, chronic pain, anxiety, rare disorders (ataxia, dystonia) and Myalgic Encephalomyelitis (ME). The next speakers highlighted the unmet needs in three specific conditions that could be addressed by VoT2. Paola Giunti (University College London) explained that ataxia is a rare disorder, which causes loss of balance with unsteady, irregular, wide-based gait with swaying and risk of falls. Limb movements are irregular and fragmented; there are problems with eye movements and speech is slurred. There are various forms of the condition. In terms of the ideal patients’ clinical pathway, Paola Giunti outlined the work of the UK’s Ataxia Centres. These are specialised centres which receive patients that are referred by neurologists and GPs. Patients see the same neurologist on every visit, which guarantees continuity of care. Neurogenetic nurses offer support both during and between clinic visits, also to discuss medical, social or financial queries. Physiotherapy, Occupational Therapy and SALT are available too. The Centres have close links with primary, community and secondary care services for shared care and education on the various forms of Ataxia. Patients prefer Ataxia Centres because of their specific understanding of Ataxia, their confidence in the specialised neurologist, the medical advice on managing symptoms, the precise diagnosis and practical advice about living with Ataxia and information about research – in general, they feel they can cope better because of the support received in these Centres. These clinics also contribute to cutting costs. Diagnostics and access to care, starting with the lack of consensus on the diagnostic criteria. Consensus would be highly beneficial to ensure early as well as accurate diagnosis. Ideally, patients should have access to appropriate, patient-centred care in a multi-disciplinary setting with planned follow up. This is crucial for children and adults in various degrees due to the different levels of severity of the disease. However, there is a lack of effective treatments. The current ‘recommended treatments’, Cognitive Behavioural Therapy and Graded Exercise Therapy, can cause further deterioration, increased suffering and worsening of symptoms due to lack of consideration for the limitations of the patients. Education: There is a lack of understanding of the disease and of its severity and consequences. Not only amongst health professionals but also among patients and carers; it is unclear where and how care can be accessed. Children: this is a crucial area as children are vulnerable and need to be protected. In general, their prognosis is better than the prognosis for adults but the condition needs to be recognised and accepted, also by the (school and home) environment. Parents should be able to take care of their children without having to fear for their parental rights. A model for transition from child-centred care to adult oriented care systems should be put in place. Home tuition or on-line learning could provide an opportunity to break through the isolation. The patient’s wishes should be recognised in every aspect of the disease and its treatment. In terms of VoT2 and the preferred patient pathway the focus should preferably be on children as they have additional needs and are generally excluded from clinical trials. This is also an issue for the EU Health and Research programmes. Nancy van Hoylandt also called for the development of guidelines for schools, social workers, health systems, for education of healthcare providers, creation of a model for transition from child-centred care to adult-orientated health care systems and possibilities for home tuition or on-line learning. Nick Guldemond (Institute of Health Policy & Management Erasmus University Rotterdam) underlined the major societal impact of chronic pain; 95 million people are living with the condition. The total cost across Europe is estimated to be as high as €300 billion, of which 90% can be attributed to indirect costs such as productivity loss, social security and welfare payments. Chronic pain has a severe impact on the ability to work and career, on quality of life and on relationships. A recent survey conducted by the Pain Alliance Europe confirms the impact of chronic pain on EU citizens. The findings also indicate a treatment gap in EU countries, mainly related to a lack of early diagnosis and timely intervention. A holistic approach, anticipating the needs of patients is scarce. Pain is a complex phenomenon, as there are cultural, perception and social issues at play as well. Much knowledge has been generated from an academic perspective; we now need to capitalise on this knowledge and turn this into strategies and actions that work in practice. Moreover, we need to broaden the ‘health-only’ policy perspective and focus on employment and other relevant policy areas. The VoT project has demonstrated that we can unite different stakeholders at all levels, linking patients to health care professions and policy levels. Industry has a role to play as well. The EU can support the exchange of good practice in relation to ‘work floor’ based programmes and support communities that can help implement these programmes and feed back to research areas. National governments have a role to play as well and need to look beyond national interest; it is important to scale up what we know as we cannot afford to reinvent the wheel. The final speaker, Stéphane Hogan (DG Research, European Commission) saluted the interesting results and conclusions of the VoT project, which states the huge need to better address brain conditions. The VoT expertise will help guide policy development in research, as well as in healthcare for brain-related disorders, given its focus on sustainable patient-centred and holistic care. There is clearly a need for more research to address the gaps identified by the VoT study, especially in relation to early diagnosis and intervention. The Commission is convinced of the need for more research to address those gaps. Other stakeholders, such as the Member States, will also need to be convinced and encouraged to coordinate their research efforts. There are many knowledge gaps regarding the drivers of these conditions. The Commission has contributed to address these gaps through its support to research in successive Framework Programmes for both translational as well as basic research. Over the years many successful projects addressing brain research have been supported. The current Horizon 2020 programme has a challenge-oriented oriented, bottom-up approach for collaborative research. There are also increasing resources dedicated to basic research via the European Research Council. Stéphane Hogan gave examples of successful projects. e-Health and new technologies have major potential contributions in this domain. The Commission recently published a mid-tem review of its Digital Single Market Strategy (which comprises a strong health component) and has announced an Action Plan on Digital Transformation of Health Care for the coming autumn. Digital health and related applications will benefit all aspects of healthcare. Furthermore, the Commission has fostered partnership and coordination in health research; the Innovative Medicines Initiative (IMI) is a public-private partnership with a significant focus on brain-related disorders, while the EU Joint Programme in Neurodegenerative Disease Research (JPND) has enabled more 30 countries to coordinate part of their research efforts in this field. International cooperation beyond Europe is also needed. For instance, for traumatic brain injury, the EC is collaborating with the US and Canada. The Commission intends to continue to encourage and support similar efforts for enhanced collaboration and coordination in brain research through upcoming calls for proposals of Horizon 2020. 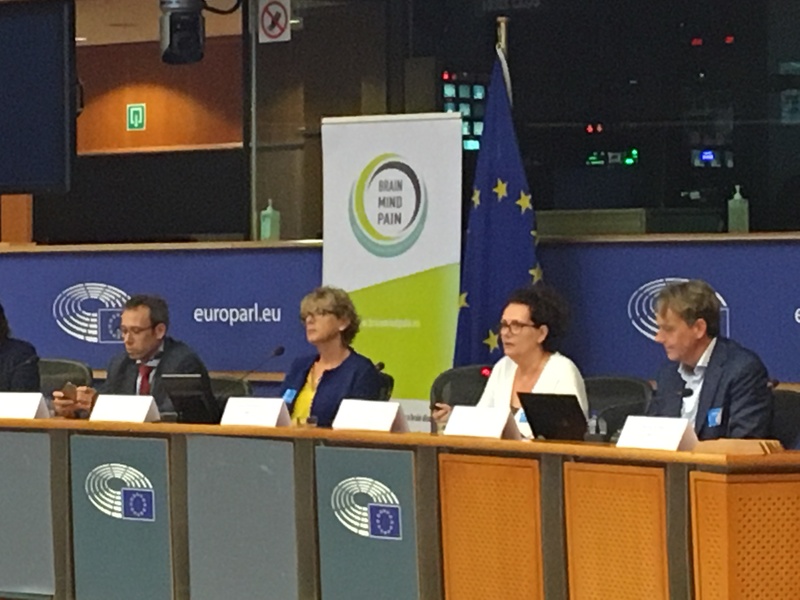 Nessa Childers MEP (co-chair of the Interest Group on Mental health, Well-being and Brain Disorders) congratulated EBC on its efforts and underlined that there is a clear need to connect research to people, as many people are suffering (often in silence). She also wondered if research has been done on the intersection between the psyche and the soul. Brain Hayes MEP (chair of the Interest Group on Epilepsy) has made efforts in recent years to get these issues on the policy agenda, both at EU as well as at national levels. Brain research should be coordinated across the EU; all too often, this area does not get the same level of attention as other health conditions. We have to seek the opportunities to address this area bearing in mind that multi-agency funding is crucial. Mr Hayes congratulated the Commission on its efforts and its collaboration activities in the area of brain research. MDTI was suggested as another area which could be addressed by VoT2. It was suggested that in order to create the critical mass to address certain brain conditions, young researchers and neurologists would need to be brought on board. In many countries navigating the healthcare system can be complex – where can the appropriate care be found? The expertise is there but the problem is how to organise this into a personalised and dynamic way. MEPs and MPs should have more contact with another so that the Member States can be spurred into action. Silos need to be overcome on both sides (EU as well as national level). National Brain Councils can support the dissemination of the VoT findings at national level. EBC will also look into the feasibility of developing country specific studies. Ann Little closed the meeting, thanking all MEPs, speakers and organisers.